I have written extensively about how this staff could not win a National Championship someday unless there were massive changes and Coach Mario Cristobal became more flexible on offense. I felt there was a very low chance of that happening, as it appeared that he was going to be stubborn about “establishing the run,” and “wearing them down,” with the pounding of the A-gaps from the Pistol formation. Yet, in the first drive, the first running play was an old Outside Zone Read from the Shotgun formation, and the next running play was a Power-Play in the original Shotgun formation (used in the original Oregon Spread Offense) and the drive progressed from there. By the time the Pistol formation was used, it generated good yardage, and as the first half continued, we watched a combination of the prior three offenses. The playbook certainly opened up in the passing game as well. It was like watching the Oregon of old, generating 28 points in the first half, on pace to a “50-point-game.” The final score of the first half only took 31 seconds and it felt good … like the old days. Jumping out to such a lead changes the game for the opponent and makes the Oregon blitzes out of the 3-4 defense operate more successfully. Whoa! This is an Inside Zone Read from the Shotgun! We know about the mistakes in the second half, and other writers can delve into that later this week. But I cannot believe how the coaches actually did learn, did change and brought back the diversified offense seen in the second half of last year. Unfortunately, during crunch time, Cristobal went back to his safety blanket — the impotent Pistol formation plays — and, consequently, the game was closer than it should have been. But overall this game was more than progress: this was stepping back from the cliff. That attitude above could be a nightmare for Athletic Director Rob Mullens if it persists at the time fans renew their tickets and donations to Oregon football. It is already known that season ticket sales are way down from the record of 43,295 in 2011 and dropping much further will endanger the progress and growth of all the non-revenue sports at Oregon. The key sentence above was that it was not just about the wins and losses, and the question is whether Mullens and Coach Mario Cristobal understand that. 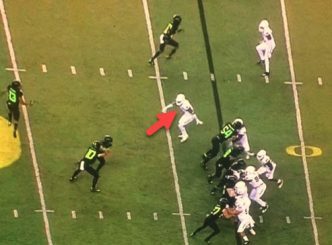 It is apparent that the message was received, and while Oregon brought back very little of the original Oregon Spread Offense, it is a great start, and it should show the staff that components of all three offenses work well when mixed together. 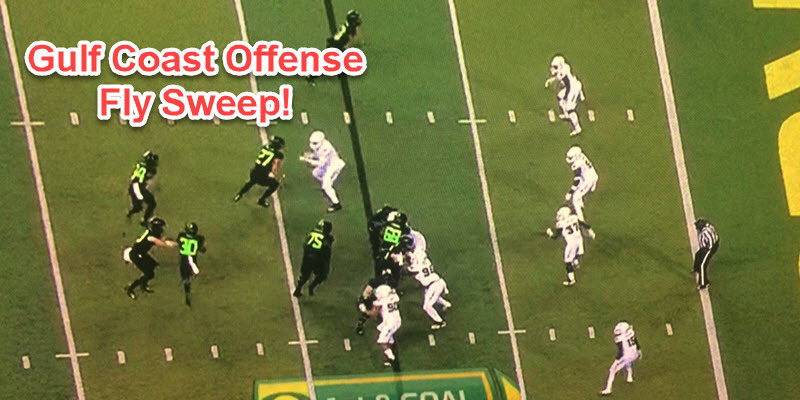 The Fly Sweep in the top photo that went for Oregon’s final touchdown came from the Gulf Coast Offense, and its timing was as crucial as the play itself. 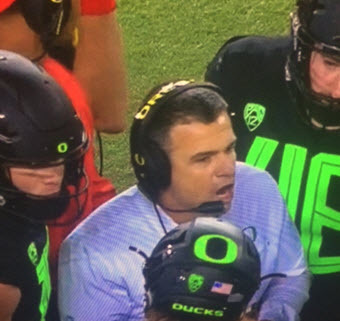 Cristobal motivates the players versus ASU. When you look at this game and future games, watch how often plays begin from the Shotgun formation, where the running back begins to the side of the quarterback, or from the Pistol, where the running back is lined up directly behind the quarterback. More yardage is gained out of the Shotgun, but on short yardage plays, the Pistol can pop some nice gains when used sparingly. The negative to me is how much this staff has yet to learn, and they will acquire this knowledge the hard way at our expense as fans. This is going to be a long road — longer than even the most optimistic fan would have predicted. This could be a long-term rebuild due to the staff’s deficiencies in knowledge and experience, but those could also be offset by superior recruiting. Fans have been preaching patience, but I do not believe they understand that the basics of life in the Pac-12 is something this staff has yet to learn. However, the positives I see are uplifting and joyous, because this staff will not drive the program into the ground. They have shown the resourcefulness to look at past successes to help them propel the program forward. They showed in this last game that they can be flexible and alter their offensive game plan in order to win. That, my friends, is the biggest victory for all Oregon fans.